Mr. Kamil Kolczynski (WCF- All Breeds Judge - Poland). All Cat Breeds are permitted. Nutered Cats can also participate. All participating cats will receive Breed Certificates form WCF. More details will be available soon here and ICF's Facebook page and website soon. Please check the Show/Rules page to understand the rules and requirements of medical docs etc., for entering your cats. Ragdoll cat LAILA gets the Best Overall and Indian Billy named PANTHER is the runner-up at the 6th International Cat Show held in Bangalore on the 17th April 2016. India’s 6th International Cat Show, organized in association with Whiskas and the World Cat Federation (WCF) along with the Bangalore Veterinary College on Sunday, played host to an array of exotic breeds, with pedigree from around the world. There was the Persian breed and the British Longhair. There was the Ragdoll breed and the Exotics, and also our Indian breed Billy, among others. There were 77 cats competing for the ‘Best Overall’ title and various other titles. And not just from Bengaluru, the participants came from Mysore, Hyderabad and Mumbai. Overall Winner of the day was Laila (Breed: Ragdoll), owned by Irfan Ahmed and Overall Runner Up was Panther (Breed: Billy), owned by Debadrita Jadhav. The venue was bustling with visitors throughout the day. Family and Children enjoyed the event very much. International Judges from World Cat Federation (WCF) Ms. Irina Sadovnikova from Russia and Mr. Anthony Aldum from South Africa - were judging and discussing about the cats with their owners. As a mandatory ICF rule, all cats entering the hall were examined by Vets from “The Bombay Veterinary College’ to ensure the cat’s vaccinations were up to date and they were free from any infection. Then the cats proceeded to both the judges to be classified and allow cats entry into the competition. Cats were allotted their dedicated cages with cat food sponsored by Whiskas, Litter sand sponsored by “Castor & Pullox Pets” store. Litter Tray, Food and Water Bowls were also provided by ICF... thus ensuring all the basic requirement of the cat was met during the show. We had cats arriving at the venue from 8:30 am onwards. 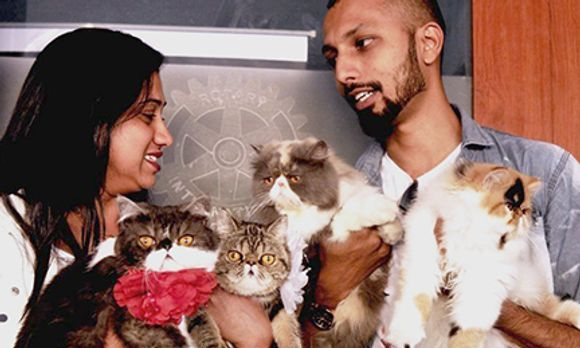 Saquib Pathan, President of ‘Nashik Cat Club’, Nashik and Shahab Ali, President of ‘Deccan Cat Club’, Hyderabad travelled to Mumbai with their club members and their cats to participate in the show. From Mumbai we had many cat parents attending the show with their cats and some of them were attending the show for the first time. Amongst them were Sufiyan Salim Khan (10 cats), Mehnaaz Khan (8 cats) and Juwairiah Shaikh (5 cats). Devandra Purbiya brought Kitten Bubbles, Daughter of ‘Bella’, who is the first cat to win ‘Best Overall Title’ three consecutive times. Just like her mother she stole hearts of many. The cats were categorized as per their breed for Traditional Judging at 12 noon and by afternoon, 4:00 pm Ring Judging started, in this round the cats are categorized in three different sections – Kitten, Adult and Neuter. Once this has been sorted 10 cats (max) at a time are called up on the dais so that the judges can take one final look to shortlist the winners. ICF Team noticed that the Judges had a tough time deciding the winners as all the cats were simply outstanding. Kudos to all cat parents who participated!!! There were around 3000 visitors coming in as well - cat lovers, cat breeders, parents along with their children, some were inquisitive visitors who were curious to see the gorgeous feline participating at our show. The Seminar had 2 sessions First session in the morning and Second session post lunch. The Attendees were provided with Seminar manuals and writing materials. The Attendees also received participation certificates at the end of the session. The Bengal Cat VICKVINS SHERNI wins at Hyderabad! NOBU WASABI, the Black Persian gets Runner-up. 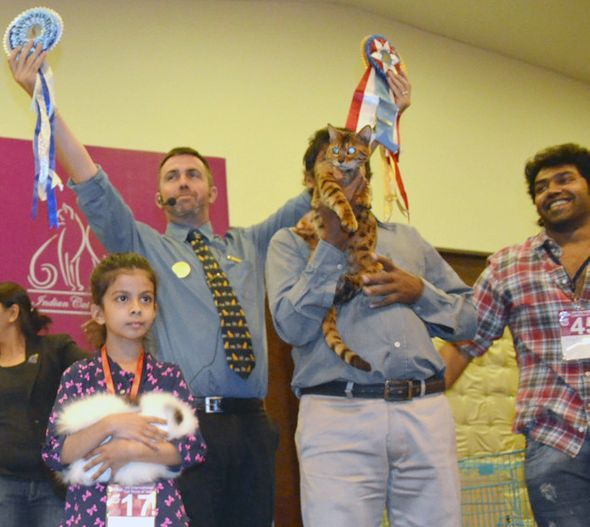 Cat lovers of Hyderabad turned out in large numbers to witness the first International Cat Show in the City. 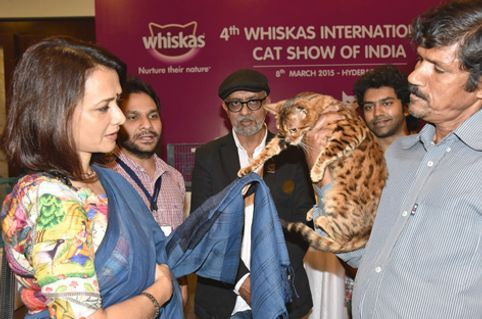 ICF held the Whiskas 4th International Cat Show on 8 March 2015 at Hyderabad at the JRC Convention Centre. 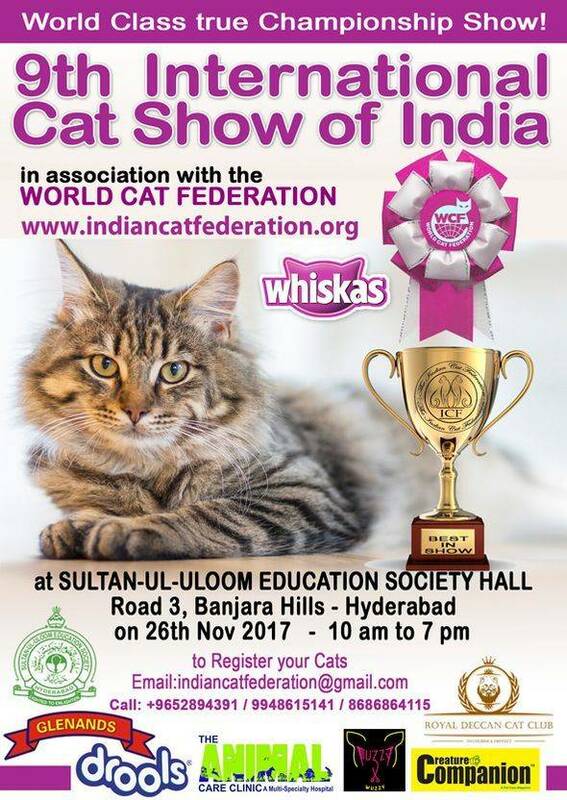 Thanks to the efforts of the newly formed Royal Deccan Cat Club of Hyderabad, who supported the event and made excellent arrangements for the show. The venue JRC Conventions centre is one of the best we got among all our shows so far. The event was well participated with over 100 Cats of different breeds competing for various titles. At the outset, we were pleased to have two International Judges from World Cat Federation Mr Anthony Aldum from South Africa and Ms Julian Schuller, both all Breed Judge of WCF. To begin with the show and for the mandatory ICF rule, each cat was first examined by Vets, we were grateful to have vets from “Animal Care Clinic” and “The Hyderabad Veterinary College’. The vets have ensured the process of cat’s eligibility for the show and made all the owners to proceed to judge Mr. Anthony to classify the cats and allow entry to the competition. The Event was attended by more than 2500 visitors consisting of many VIPs. Well known Actress and the Chairperson of the Blue Cross – Hyderabad Mrs. Amala Akkeneni, was the Chief guest and she appreciated the efforts of ICF to bring the Cat Show to Hyderabad. She felicitated the International judges with mementoes. She had accepted to be a Patron of the Indian Cat Federation. Our sincere thanks go to Dr. Lakshmi Srinivasan, of Animal Care Clinic, who accepted to be one of the Vice Presidents of ICF, and the excellent support and guidance given to ICF to organize the event in Hyderabad. The overall winner of the day was VICKVINS SHERNI, a female Bengal Cat owned by Mr. Vineet Raju and the Black Persian owned by Iman & Deena won the second place. Whiskas 3rd International Cat Show was held on 21st and 22nd February in Bengaluru (India) at Woodlands Hotel and was organised in association with World Cat Federation (WCF). Participant’s enthusiasm during this show was admirable. 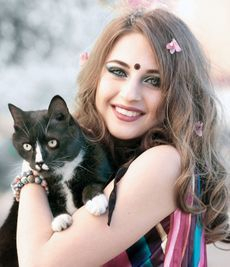 The show witnessed different cat breeds such as Thai, Arabian Mau, British Long Hair, Siberian, Persian, Himalayan, Original Long Hair and our very own Indian Billi. Amongst all the cats that participated there was a cat named ‘Pasha’ the eldest cat (8 yrs). Judges commended the owner Mrs. Noor Jahan on her good health and being well maintained. Apart from the regular categories we had introduced People’s Choice Award, Best Cage Decoration Award and Facebook Selfie Contest Award. These three new categories received the maximum participation and the participants were engaged to win these titles as well. This show received the highest number of visitors each day and we involved them for People’s Choice Award. Visitors has chance to choose the most beautiful cat according to their likes. 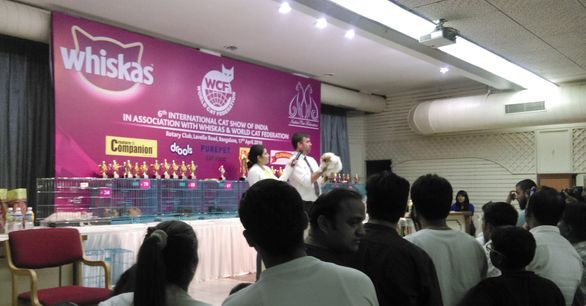 ICF pleased to have three International Judges from WCF who judged the feline as per International Standard. Ms. Tatajana Cernova, 2nd Vice-president of WCF, Dr. Johan Lamprecht, President of the Cat Association of Southern Africa and Dr. Thea Lamprecht, an all Breed Judge of WCF. ICF also honoured to have Dr. Yathiraj S, the Associate Dean of Bangalore Veterinary College to join us and visit the cat show. ICF are extremely thankful to him and his team for all the support provided during the cat show. Bella winner of Whiskas 2nd International Cat Show (Mumbai) had participated and won Best Overall on Day 1. Also Bella is the first cat to win ‘Best Overall Title’ for three consecutive times. Our very own Indian Billi – PARI Jadav stole hearts of many including the judges and made her way to the top place by winning Best Overall on Day 2. Participants were proud and excited with all the Medals, Ribbons, Trophies and Certificates won by their cats. ICF thankS all the members who believed in us and joined us in making this show successful. Whiskas 2nd International Cat Show was held on 27th – 28th Sept in Mumbai (India) at Stallion Banquets was organized in association with World Cat Federation ( WCF ). The show had varieties of cats participating; witnessed exotic breeds and also very own Indian Billi. It was an eventful 2 days show with cats and their owners competing in the right spirit. The excitement level was high throughout the show. The show was honored to have Dr. A.M. Parturkar, the Associate Dean of Bombay Veterinary College for the show and extended his support for ‘Project Billi’. He shared a few words of encouragement with all the cat parents. ICF is extremely thankful to him and his team for all the support provided during the cat show. Bella, owned by Devandra Purbiya stole the show by winning ‘Best Overall’ category on both days. 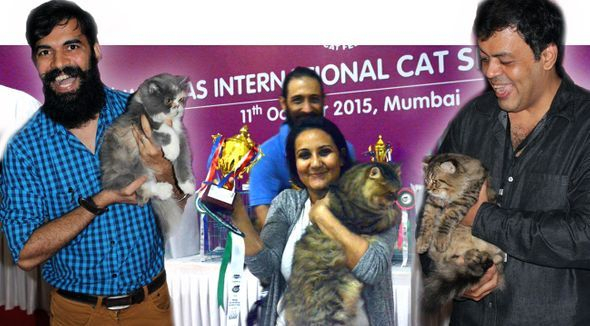 The show ended on a high note with all the proud cat parents posing with the trophies their cats had won. The show was received overwhelming response from visitors on both days. ICF stand humbled by the sheer participation and faith Mumbaikars had in ICF. CHOTTU the British Long Hair Cat Wins the tittle Best of Best at the 1st INTERNATIONAL CAT SHOW OF INDIA! The 1st International Cat Show of India was held on the 27th & 28th April 2013, in Bangalore, enthralling cat lovers from all over India. 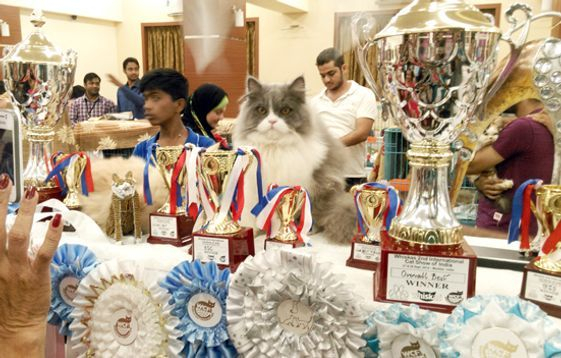 Held at hotel Chancery Pavilion, the event attracted more than 100 cats each day, competing for the title of Best in Show in various categories, as per the rules of the World Cat Federation (WCF). The Show also saw more than 3,000 visitors including children, who were all excited to see so many cats under one roof. The venue was abuzz with purrs and meows as the sophisticated felines enjoyed the attention. The event was organised by the Indian Cat Federation (ICF) in association with the World Cat Federation (WCF), which is based in Germany. 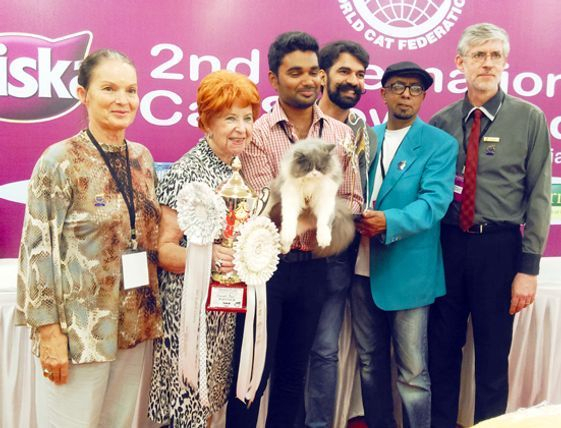 The President of the World Cat Federation , Mrs Anneliza Hackmann lead the Judges team along with the Mr. Andreas Mobious (General Secretary – ICF) and Ms. Marion Meister (All Breeds Judge – ICF) and judged the competing cats and provided advice to the cat owners attending the event. 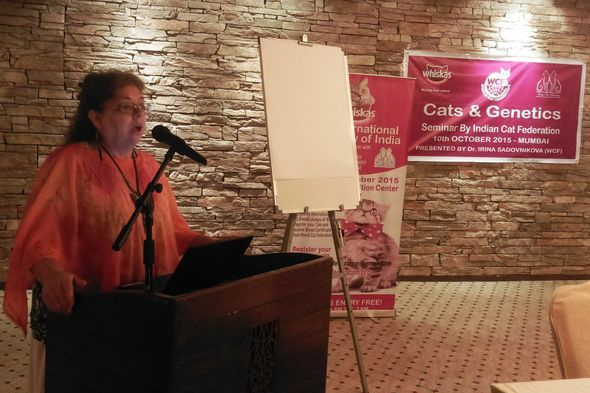 The President of the Middle East Cat Society – Dubai (MECATS) Ms. Petra Muller provided ICF with organisation assistance. Besides celebrating felines, the show was also aimed at providing a platform for Indian cat breeds to be showcased on an international level. The ICF President Shree Nair announced that the ICF intends to conduct a research on Indian cats and present them to the WCF for approval as an international breed and will be known as ‘Billy’. 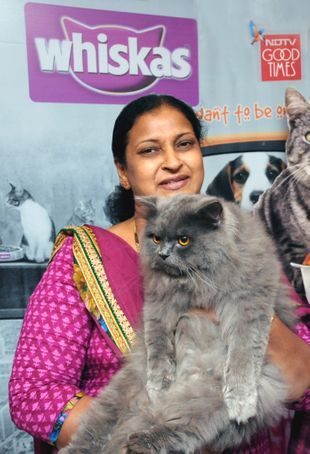 A British Longhair male cat named “Chottu”, owned by Ahmed Iqbal from Bengaluru, won the ‘Best in Show’ and ‘Best of Best’ titles on both days. 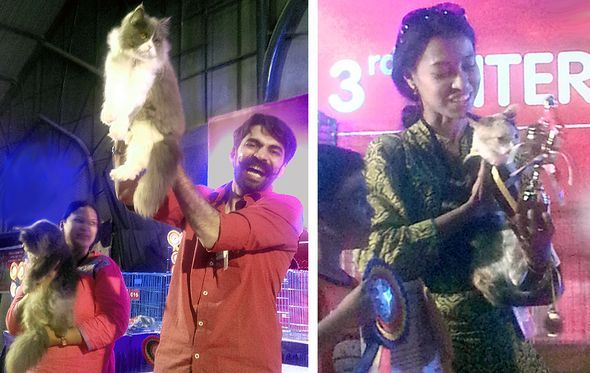 A male cat named “Pur Pur” owned by Phirooza Rustumji (Bengaluru), was adjudged the Runner-up.Many other prizes were presented for various categories.